Clean, healthy water starts with filtration. 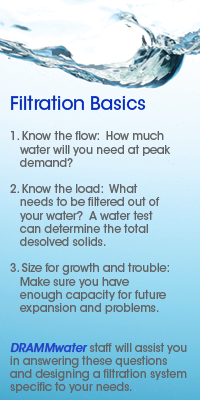 Filtration will remove many of the contaminants that reside in your water. Whether your source is municipal, a well, surface water or recycled water, filtration will be a necessary step in cleaning your water. DRAMMwater will provide complete, engineered filtration solutions for any problem. By combining superior filtration technology, years of engineering experience and other water treatment options, we can provide you with clean, healthy water. For more information contact us at the numbers to the left, email us or download a form to request a proposal. DRAMMwater uses Marlo's NXT2 Timer to schedule backflushing of your filter vessels. This video covers programming the timer. DRAMMwater's Al Zylstra covers filtration basics in a presentation from the Water Quality Education Alliance webinar series.